Plane Boats is proud to offer a beautiful full color T-shirt featuring the plane boatcruising through Beth Avarys Twin Universes artwork, illustrated here. On the shirt back is the phrase Build Spaceships Now in purple that refers to the jumpsuit Desdemona received from playful boatyard friends encouraging her efforts to transform the boat into a rocket ship. The shirts are printed on high quality Hanes Beefy-Ts in small, medium, large, extra-large, 2XX and 3XXX that are $15 each with $4 shipping and satisfaction guaranteed. Additional items include a booklet of articles featuring newspaper and magazine stories about the plane and boat for $9.95, a video cassette of television segments, Where Is Joe Merchant? books with a Purchased Aboard The Cosmic Muffin stamp, and 8"x 10" photo prints of the Hughes 307 and plane-boat. 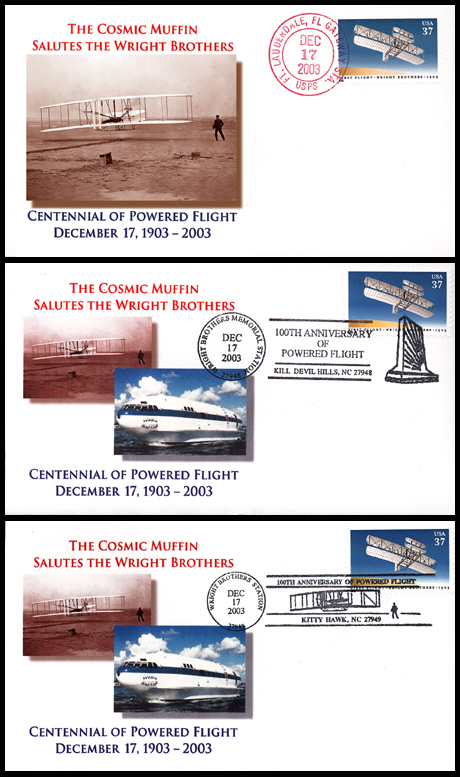 A limited edition of three philatelic covers were issued by Plane Boats, Inc. on December 17, 2003 in honor of the 100th anniversary of the Wright brothers first powered flight. The covers were designed by Webmaster Albert W. Starkweather and were postmarked at Fort Lauderdale Gateway Station; Kill Devil Hills, NC, where the flight took place, and at Kitty Hawk, NC, where the Wrights were staying during the flight experiments. The latter pair have special pictorial cancellations issued by the U.S. Postal Service.